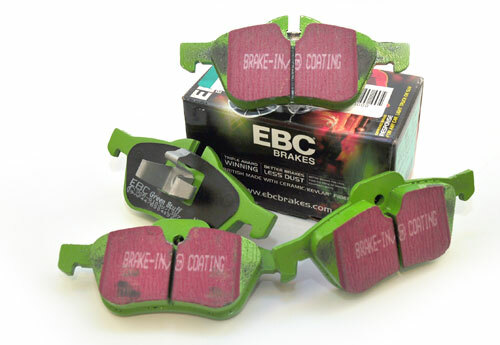 One of the most popular aftermarket brake pads on the market is the EBC GreenStuff brake pad as they offer much lower brake dust while improving braking performance over OEM pads. Next time your MINI is need of a brake pad change, consider the EBC Green Stuff pads. Designed for premium street driving, these green guys offer better brake effect up to 600°C (1100°F). EBC Greenstuff has a high initial brake effect and gives drivers confidence from first application of the brake pedal. There is no such thing as a NO DUST brake pad. The very nature of how a brake works requires that some dust be generated to avoid rotor vibration (shimmying). The EBC pad creates less dust and dust is more easily washed off than most. All pads create more dust as they are bedding in especially if rotors are worn. Nominal friction coefficient 0.55. For heavier faster cars and vehicles above 200bhp we strongly recommend Redstuff which DOES offer much less dust. Front and rear pads sold separately. Sold as sets of front or rear. Most aftermarket REAR pads do NOT have a location for the rear sensor including Hawk, Mintex, SP Performance, ATE and many others. The rear sensor was not added until 2004 after most companies had made their molds, and they simply have yet to update them. Because the front pads nearly always wear out first, this tends to not be a problem as the front sensor will trip first. Occasional inspection of the rear pads will help reduce the risk of running them into the metal. If you have a 2004 or newer MINI, please tie back the existing sensor with a zip tie when re-assembling your brakes.